It's hard enough for club members to make their way down dark roads to the star party when they're running late. The general public always has problems knowing where to go... Why not make some transportable signs to direct people? 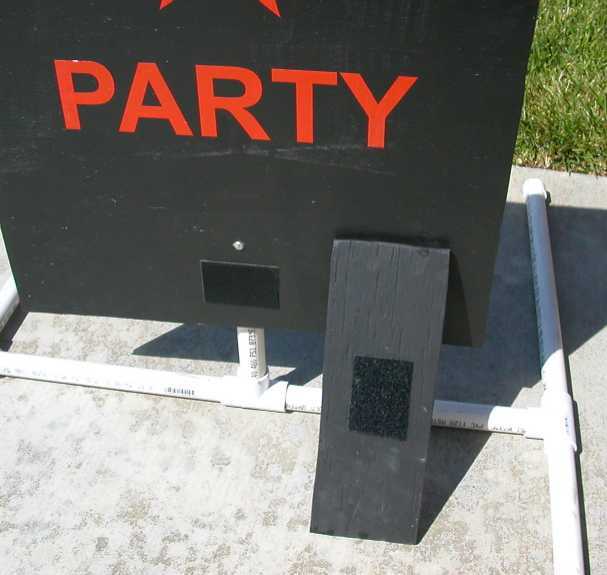 The sign pictured is nearly 1 year old and has been at many, many star parties and is holding up fine. I made a second one that has stars arranged like the Big Dipper on it, a pattern nearly everyone recognizes. 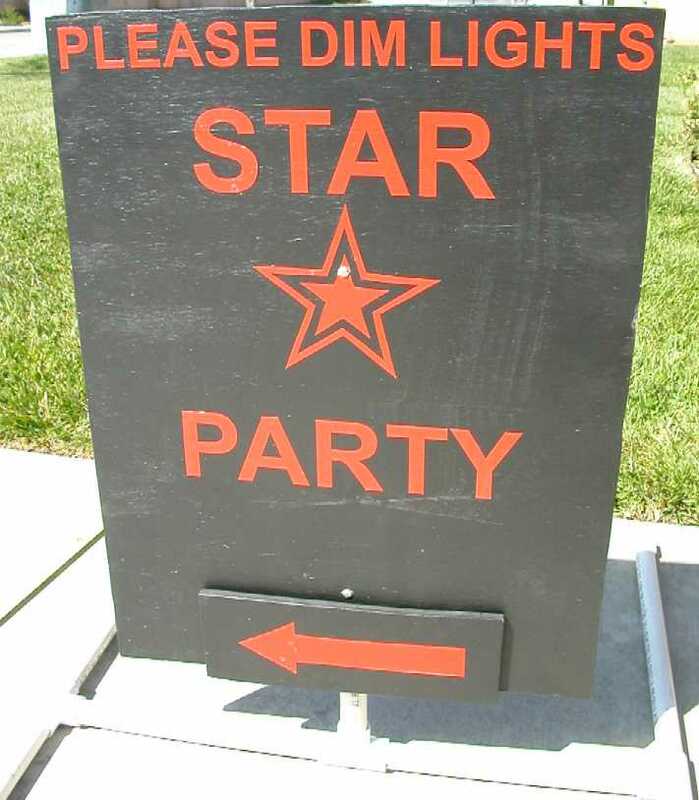 The sign reads, "Star Party Ahead". We have some pretty strong and continuous winds during the day where I live, so I opted to go with a low profile design. I haven't had one tip over yet. I started the project by laying out what I wanted the sign to say on my computer using PowerPoint just because I know how to use this program fairly well. A word processor could have worked just as well. After planning what word would appear on what line, I printed out each letter on a sheet of paper at the size and thickness that I was going to need. I cut each letter out carefully and traced them onto the reflective sheet. Cutting out the letters with the Exacto knife is not the fun part of this project! I made some stars on my computer and printed them out at different sizes. I used a couple of closely sized ones for the 'star-in-star' pattern, first cutting them out on paper and then tracing them on the reflective sheet. Cut out, sand, then paint both plywood pieces. I gave the sheets a couple base coats of polyurethane and let them dry before I stuck the letter on to give them a good, non-porous surface to adhere to. Cut the other 6 ft section of PVC as follows: two 18" pieces and one 24" piece. Next, test assemble and then glue the two 18" pieces together with a "T" in the center. Next, DO NOT GLUE but place the 24" piece in the "T" between the 18" pieces. You will use this as a handle to make sure the center "T" is aligned vertically when gluing the "H" together. 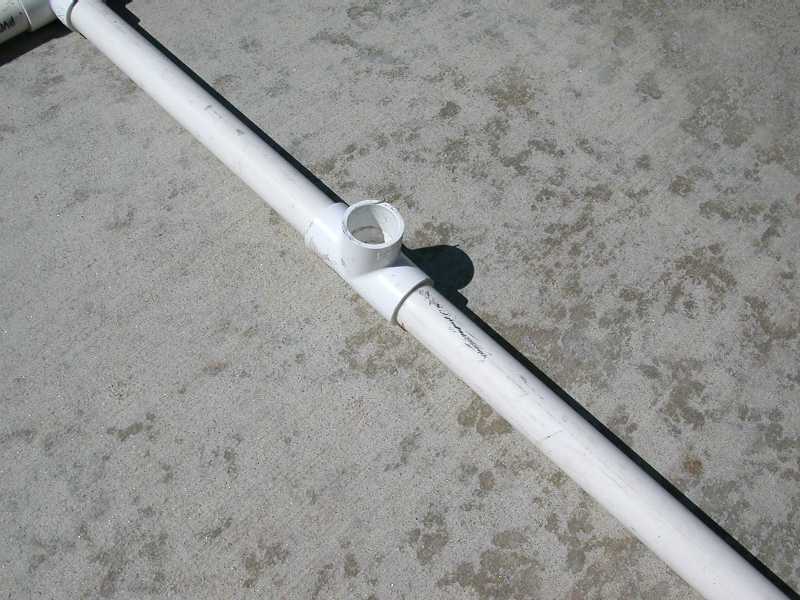 When gluing PVC, you only have a second or two to get the pipe aligned before they are joined. You have to get this next step right or your sign will be crooked. Glue the cross member into one of the sides very carefully, taking care to make sure that the center "T" is very close to vertical. Working quickly, use the 24" piece to lever it into position. Lay the joined pieces down on some flat concrete and it's a simple matter to glue the second side on to complete the "H" as pictured here. Using a funnel, pour sand into one side of the "H" through the center "T" until its about 1" from the junction. Roll it side to side to get it really filled up. Squirt some silicone caulk into the hole on that side of the "H" to block the sand in. Let this dry for a couple of hours so it will really hold the sand in.. Turn the "H" around and use the funnel to fill the other side with sand. squirt enough silicone down the hole to fill up the void to within 1 1/2 inches of the top of the "T". Leave enough room to put the sign post in the hole! Carefully lay out the letters on the sign board. Use light pencil lines to keep your lines straight. Press the letters down securely. Coat the entire sign with three or four coats of polyurethane. Let dry. Lay the arrow out onto the smaller piece of plywood. Press the arrow down securely. Coat the entire piece (front and back for this piece) with three or four coats of polyurethane. Let dry. Carefully measure the location for two 1/4" holes in the sign. Drill these holes. Push the carriage bolts in from the front of the sign. 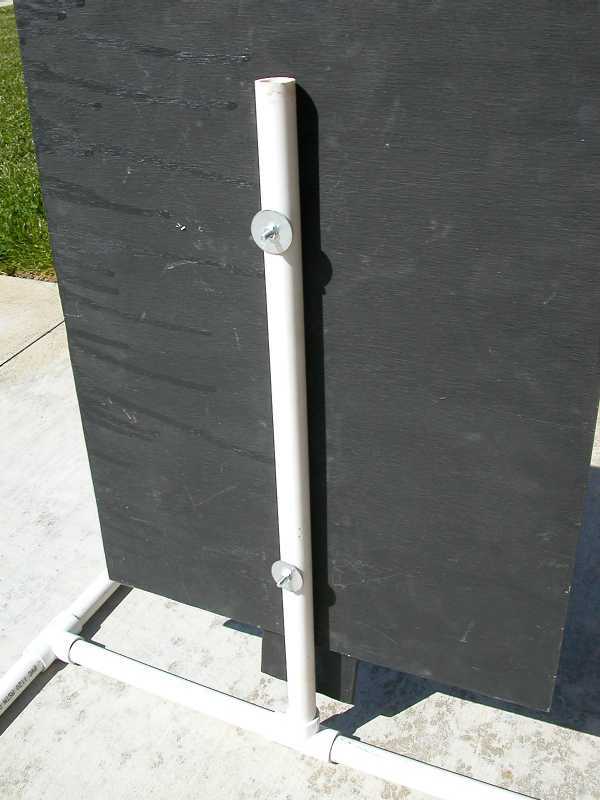 Flip the sign over and lay the 24" piece of PVC along the sides of these protruding bolts. Making sure that the PVC doesn't extend past the top of the sign, mark the PVC pipe with a pencil at the location that the bolts touch the pipe. 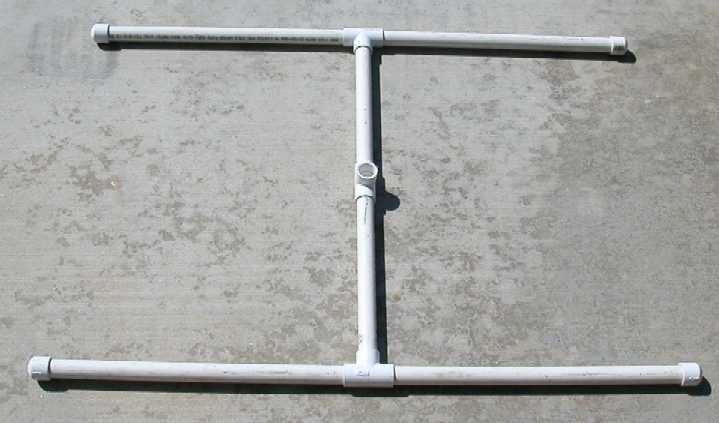 This will allow you to simply match drill the bolt holes in the PVC pipe. Make sure not to drill the holes in the pipe at an angle to each other. I accidentally drilled them using a hand drill at a slight angle and had to open both holes up a bit. This was no problem however. Push the pipe over the bolts, put the washers on and secure the sign to the pipe using the nuts. Tighten until the pipe begins to deform a little bit to get a snug fit. Test fit the arrow on the sign so that it can clear the ground when pointing up, and is centered when pointing either left of right. Put the piece of Velcro (the hook side) on the sign. I recommend Put the fuzzy side on the back of the arrow. Stand the sign up in the base. Congratulations! !